Sun Cellular offers a new SIM called, Call and Text International SIM, that allows anyone to text their loved ones abroad for only P1 per text message. This SMS rate applies to 20 countries namely: USA, Canada, Singapore, Hong Kong, United Arab Emirates, Malaysia, Macau, Japan, Qatar, Brunei, Guam, Hawaii, Oman, Cayman Island, Cyprus, Turkey, Northern Marianas Island, Jamaica, Bahamas & Puerto Rico. 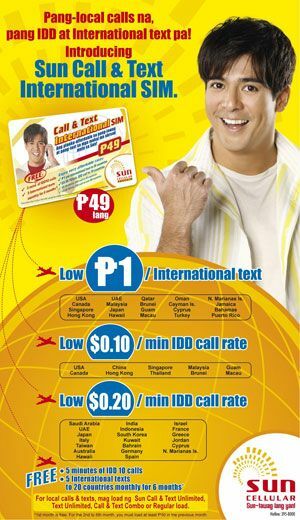 Where can the Sun Call & Text International SIM card be purchased in the Manila area? I searched many Sun shops and independent cell phone shops and none of them had it in stock. Thanks. May I know the rate for text messages sent to Australia? oo nga..kapag ginamit mo ang pagtawag.kahit di sinasagot ng tinatawagan mu abroad..kinakaltasan nila ang load…kaya mo nga pinili ang promo nila kasi ini-expect natin mas makakatipid tayo..eh mas lalo pa tayong napamahal..hai..
Can 1-Peso International SMS by Sun Cellular be used as regular prepaid sim as local sim here in the philippines? thanks! Yes good service by Sun Cellular for anyone that doesn’t have access to skype. pano nmn po yung me sim card ng sun d mkka avail nyan?